Wish I would have had this product with all of my six grandchildren. it is wonderful the way you can start babies out so young signing, and actually be able to communicate with a six month old or younger. I think signing is such a great language to start teaching little ones. This kit has been a lifesaver for my family! My daughter loves to watch “Babies” and always signs the intro song as if she’s singing it with Rachel. Being able to communicate with her has saved my little girl from having countless meltdowns. Super excited for our newborn to start learning and be able to respond to the signs his big sister is already doing for him! We plan to continue with ASL as a family. I had ordered two of these kits in order to try to help my autistic grandson communicate with us. I kept one for myself, and gave one to his mother. I found the kit to be very well-made, very useful, and I believe it could have helped with the communication problems that my grandson was having. Unfortunately, his mother did not want to try teaching her son sign language, so I never got to fully use the product. I still have it though, and may one day be able to use it. Fortunately, as he has gotten older and is seeing a speech therapist, his communication is getting better. I still wish she would have tried sign language when he was younger. Not being able to communicate is very stressful, both on him and his friends and family. I would encourage anyone with a child who cannot speak to start sign language early. It has been such a wonderful and educational way for my son and I to bond. I discovered this program when my son is four months old and he is now two years old. In that time span he has learned so many vocabulary words and he easily remembers them. I believe that the program has helped him speak much sooner than expected as well. He loves the songs and know all the words to them. We also enjoy reading the books using the App. He loves all his flash cards and it’s such a great way to keep his mind sharp and curiosity satisfied. I have told all my new mom friends about your products and highly recommend it. My daughter is now 16 months and its amazing how many words she can sign. We are in love with these products. These product it helped everyone at home, Daddy was able to sign with a customer at work, and grandma recognizes the signs. i strongly recommend these products and I’m looking forward to purchase some more DVD’s. I can’t praise baby sign language enough. It changed our lives! My daughter Fiona, started at about 8 months and by the time she was a year, she had learned all of the words on the videos and in the flashcards, as well as signs we looked up on the website. Fiona was leaps ahead of her peers, talking in sentences by 18 months, and now at 2 years old she TEACHES our extended family members signs. She is starting to learn the alphabet and because she has the concept of ASL she can relate the letters with the signs. BSL has truly been wonderful for us, as we have learned right along with her. Thank you for the gift of communication with our daughter. We are very excited to start with our second daughter Claire, who is now 8 months and are ecstatic that Fiona can teach her! Both my daughter and son love it! My daughter is four year old and my son is one and half! One day, my son pointed apples on the table and said “apple” and then did the apple sign. He learned a lot from baby sign language and enjoy it a lot! My daughter learned baby sign language and signing time and she loves it. I commended this product to my friends and relatives! This is a fabulous product for keeping little minds busy and facilitating early communication with our children and (in my case) grandchildren. We started using the flash cards at 17 months and my son loves them. At 2.5, he still likes to get them out and go through them to find his favorites. We keep the poster in our pantry for our regular sitter. I like the dictionary when paired with the website to see the matching video. Overall, this is a great kit, but we definitely see a lot of benefit from using Baby Signing Time videos as well. We gave this as a gift, but we have seen how well it works. She is 16 months old now and has been using Baby Sign for a number of months. There is a 15 month old at our church who uses Baby Sign also. He can communicate his needs/wants to his mother, grandmother and grandfather while he sits with them during Bible Class and church. 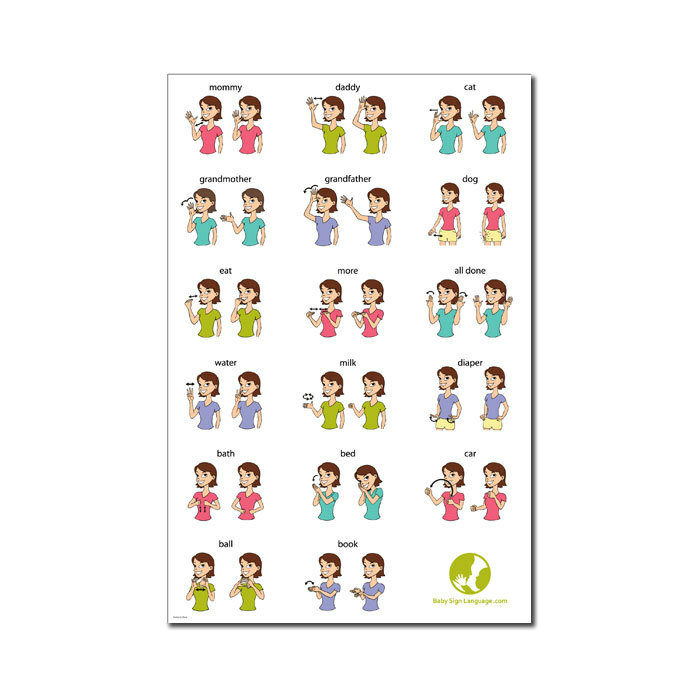 We plan to give Baby Sign to another young couple we know. I purchased the Baby Signing Time starter kit for our granddaughter. She loves it and it’s so easy for even us adults to learn at the same time. This set has help avert many frustrating interactions since it has opened up a whole new avenue of communication! She started watching and learning signs at about 15 months old. She quickly went through the cd’s and at 2 yrs old, knows her number to 20, the alphabet, how to spell her name, and very large verbal and sign vocabulary. We totally recommend this product! It is very amazing to see how much my children can communicate with people when they are only little baby! Thank you Baby Sign Language!!! We cannot live with your wonderful program! 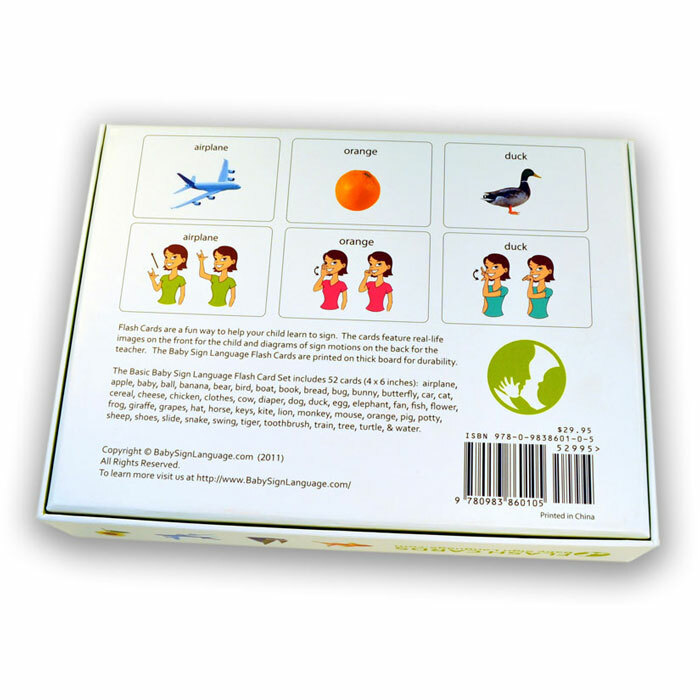 We have absolutely loved our Baby Sign Language kit. We bought the kit when our daughter was four months old and still use it to this day (she is three, now). 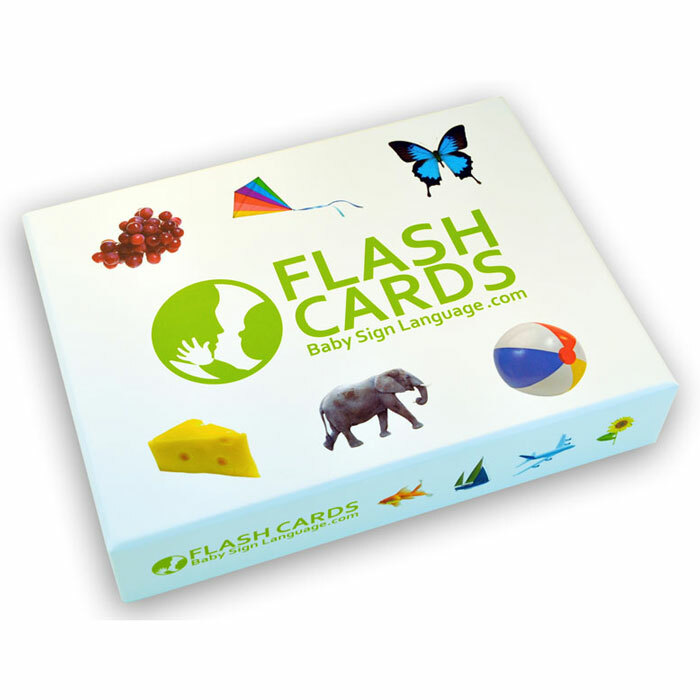 We review the flash cards and even return to the site regularly to learn new signs. I personally think that every parent should teach their child sign language. HUGE hit with our child! She has watched these since about 5 months old, and has consistently requested to watch these for the past 18 months! She has learned quite a bit of sign language and has even enjoyed the Treeschooler series, as well. You can’t go wrong with educational videos that they absolutely love and songs that will not drive you crazy, even when they stick with you in your sleep. I love this kit. My daughter loves her baby signing time dvd. Shes 15 months now but was introduced to her dvd around 7 months old and was totally engaged in it. The dvds also make it easy for parents to learn. 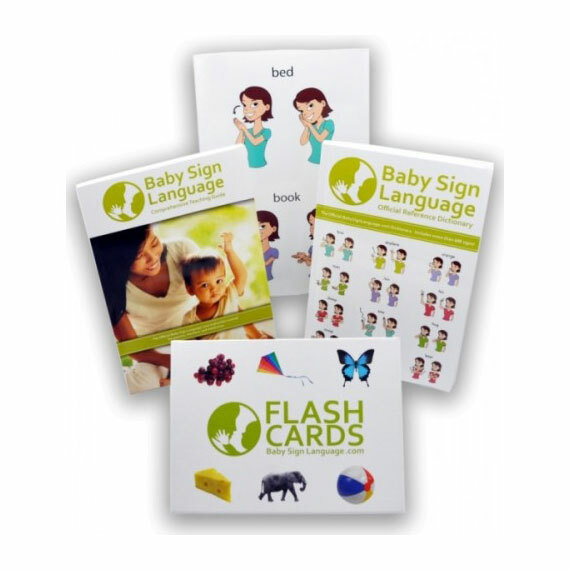 I purchased the baby sign language kit with poster, flash cards, instructions and dictionary. I found the poster was very useful for family to use, and I used the dictionary a lot. My son was signing many signs by 8 months. I have never used the flash cards. I am now beginning to teach sign language to my 4 month old daughter. My sons vocabulary is great and I found using the BSL really helped him express himself until he could use words. The poster is made well and held up well to toddler abuse! I would highly recommend this kit. Teaching our son sign language yielded wonderful results for us. Some other parents were skeptical and I think wondered, “why teach a (non-deaf) child sign language if they’ll start speaking eventually anyways?” Well our son is now 2.5 years old and I can say that it was extremely beneficial. First, it enabled us to have conversations far earlier than if we waited for him to speak. This means that he didn’t have to grunt and moan to tell us what he wanted..he could just sign it. Also we could talk about things happening…for instance if we were at the store and heard some crying he would make signs to express, “I hear a baby crying”. Later, when he did start to speak sometimes we wouldn’t know what he was trying to say and so he would make the sign at the same time to help us understand…so cool. :) Also learning sign language helped him to develop his fine motor skills and hone his attention to detail. One of the biggest benefits to teaching our son sign language is that it helped in learn early that there are “symbols which represent things”. This principle helped him to learn his ABCs around his first birthday. Using tips that we learned from the Institutes for the Achievement of Human Potential (iahp.org) he also learned how to read several hundred words before the age of two. At two and a half we’ve already moved on to more advanced topics like learning the human body (esophagus, stomach, pancreas, etc). My point is that teaching him sign language early helped to jump start his mind and imagination. And most importantly we’ve been having fun the whole time! It’s been said that “the brain grows with use” and there is hardly a more effective and fun way to engage your baby’s brain then to teach him/her sign language. These videos have been a huge help in communication with my youngest child who happens to have Down syndrome. She’s picked up on the signs fairly quickly and I love that she can express herself and that I know what she wants. She is starting to make the sounds of some words too. I love these and would highly recommend them! We are very pleased with Baby Sign Language! Our 16 month old daughter loves watching the DVDs and listening to the music and so do I! We are both learning a new language! We have had great success teaching our daughter signs and it is wonderful to be able to know what she is wanting because she can sign and let us know! I cannot possibly recommend these products more highly! We LOVE them! After purchasing the Baby Signing Time collection, we then graduated to owning the entire Signing Time Collection, Potty Time, Christmas, all the Treeschoolers, and now Signing Time Sentences! We just can’t get enough! Our toddler just turned two and at this point, is practically bilingual with English and ASL. By the time he was a year old, he had mastered well over a hundred signs and had an equal number of spoken words in his vocabulary. He can say and sign and “read” all written letters and numbers 1-20. He can identify dozens of colours, animals, objects, people, and speaks in complex sentences. Meanwhile, his same-aged peers have only a handful of spoken words and get by with grunting and pointing and frustrated gibberish. People cannot get over how advanced his is in his vocabulary and communication skills, and while I’m sure he must have some natural ability, I fully credit Two Little Hands for his success. I fully intend to someday certify as a Signing Time Academy instructor and continue building on the thousands of signs we have learned together and spread that love to others. As an educator who works with children and adults regularly, the benefits of incorporating sign into daily life seem to be self evident and I will always strongly advocate for using it. Even if it was only to learn a second language to be able to communicate with the deaf community, it would still be 100% worth it, but it is so, SO much more valuable than even that! We absolutely love our kit!! We have learned so much from the dvds and I find the dictionary very easy and useful to reference. 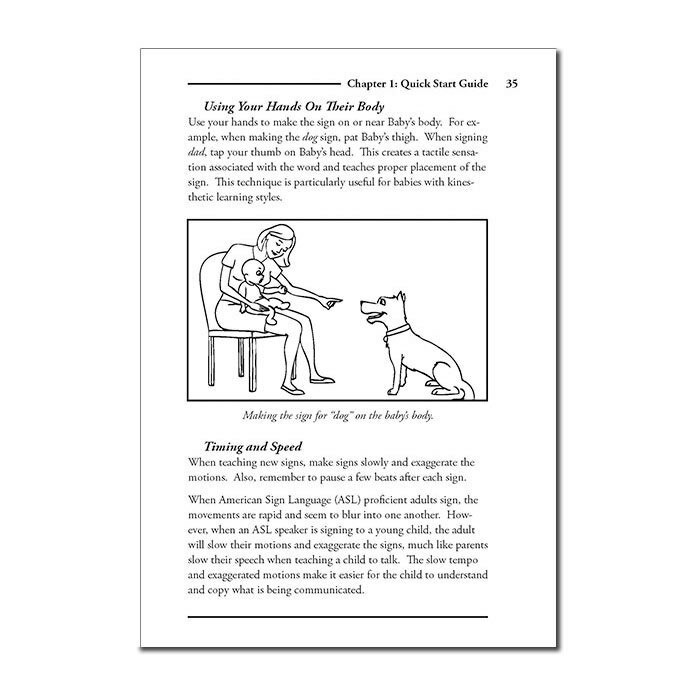 The learning guide was a great help at learning how to begin to teach ASL. My son loves pointing to the poster that also come with out kit. We haven’t use the flash cards yet, as I feel he’s to young, but I know we will enjoy them as well! My son, who is now 13 months old, loves the songs on the videos and mimics the signs while dancing. Bilingual user from Hong Kong! I love the premium kit. My son was able to sign over 20 practical signs before 20 months old with the help of the cards and the DVDs. We also love all the songs. He even asks me to sing ” baby signing time ” as a lullaby to him every night. Even though he is 2yrs8m old now, he still takes out the flash cards and ask us to play with him. Great purchase! He has recognized the signs for several months now, but has only recently been really signing himself, and seems to add more signs almost every day. He seems to have an unusually large verbal vocabulary for a baby under 1 year old, and most of the words he uses are ones he has been exposed to in BST. He lights up with the biggest smile and watches attentively from the moment he hears the giggle as the Two Little Hands logo comes on. He has no interest in any other television whatsoever. We don’t really allow him to watch movies/television, but if a TV happens to be on while he’s in the room, he completely ignores it, unless it’s Rachel and the Signing Time Babies. We also introduced the videos to friends of ours with a child a year older than our son, and it completely changed his world. He went from completely non-verbal grunting and tantrums to full-out signing and speaking almost overnight. It’s like communication finally clicked for him! It’s not just babies who enjoy them, either. Whenever older kids or adults are over to play with him or babysit, they get such a kick out of learning the signs and seeing him communicate with them. I strongly recommend them to any and everyone! Terrific product! 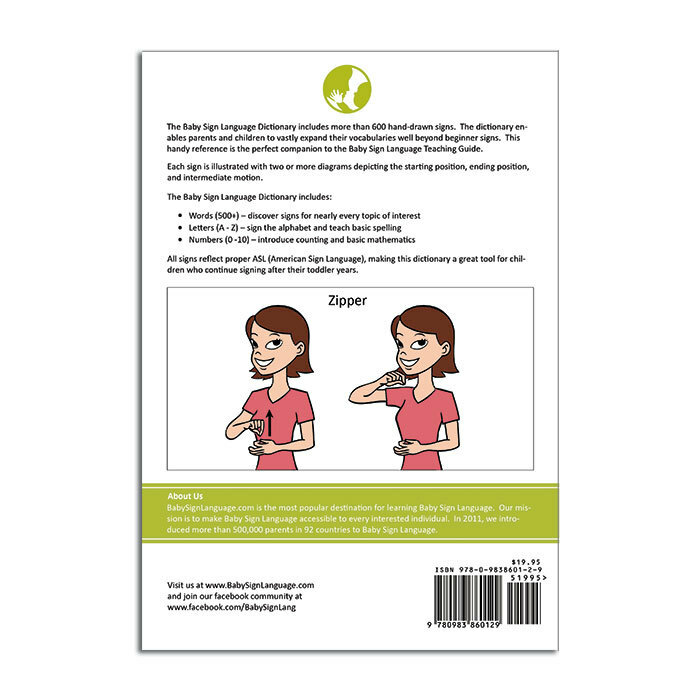 I started using the Baby Sign Language kit with my son when he was about four months old. It took some practice and consistency, but he caught on and began using a few of the most basic signs (milk was, of course, the first one he learned). From there it snowballed and he learned many new signs. He just turned two last month and still uses many of the signs, recognizes and repeatedly tells me what each of the signs from the poster are regularly, as we keep in on a wall he often sees. He also loves using the flashcards and took to them quickly. I think he enjoyed the pictures. I actually had to take the flashcards away from him because he was playing with them too much (and got a bit rough with them)! Now we only play with them together. This system was easy to use and I feel it is the reason that my son not only speaks very well at two years old, but also has a very broad and extensive spoken vocabulary. My daughter, who is now 10 months old, has finally just begun to really catch on to many of the signs. I am hoping to have similar results with her communication skills. My 18 month can already sign 45 items. She loves the dvd and cards. The only problem is 1 dvd only plays on the computer. But I would recommend this to everyone. Love it and so does my granddaughter. Thank you. I loved how complete the package was (though I didnt get the DVDs back in 2011), still I was expecting to receive laminated flashcards. The type of material in them got dirty the first time we used it and they can’t be cleaned easily. Thank you for your feedback. When we decided to use the material selected for the flash cards we had to balance between durability and the risk of exposing babies to plastic. Many parents expressed concerns regarding the materials used for lamination and the fact that babies put objects in their mouth. We decided to go as organic as possible while still delivering a product that is durable and baby-friendly. I bought this product at first because I was positive my daughter was going deaf. She was not responding to her name and stopped talking. It had to be her hearing. In the process of finding these sign tools I was able to break down communication in a way that my daughter could use. She can speak now better but still extremely under her age group. She was able to put her voice to the sign as she would sign. It unlocked her communication block that Autism has left her with. All my moms that ask how Averie has come so far I praise this product along with the Sign A Lot DVDs. This can give not only deaf but other communication challenged a way to be heard. My 3 1/2 yr old granddaughter loves the DVD’s and flashcards. She will ask to watch Baby Signing Time while she is eating lunch. she practices the signs right along with the other kids. The product is very easy to use. We LOVE you guys. 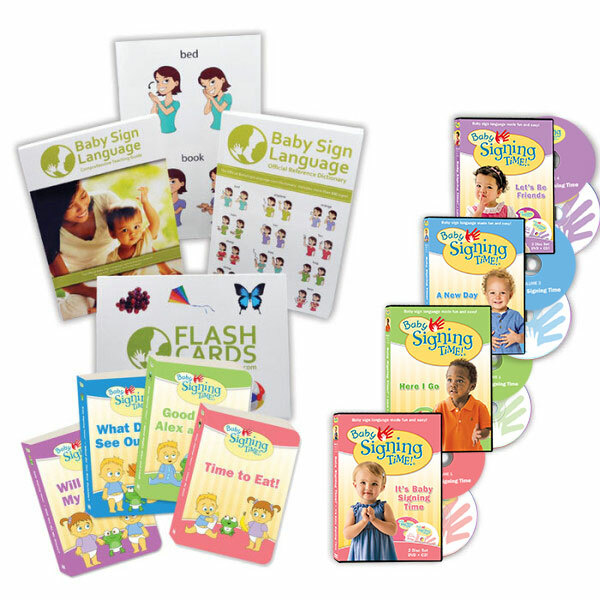 When my daughter was about 10 months old, I purchased the Baby Sign Language Kit to help reinforce the signing we do at home and as a tool to teach the babysitter about signing and for her to use to play with my daughter. Now, at 2 years old, my daughter asks to “play flashcards” and we use them all the time – we pick them up and sign with them or we use them for playing “seek”, our made up game where we a) select a card then b) sign the image, and then c) go see if we can find the same/similar item in our house. (With all the stuffed animals and toys and actual household items, we usually succeed with step c). This has been a fun addition to our Signing DVD collection and good reinforcement for our signing at home. And the babysitter benefited from it too! I loved the kit- as did our son- and can warmly recommend to anyone wanting to learn babysign together with their baby! Great quality products and the absolute favourite were the flash cards which our son absolutely loved!! I bought my kit when Master 4 was 4 months old – he’s nearly 11 months now and although hes not signing back yet he understands so many signs. My favourite is ‘all done’, if I dont use the sign he just demands more food. Its been great for all of us and we have so much fun using it. Master 8 doesnt quite understand why his little brother cant sign kite yet but we have fun just the same. I absolutely love the cd’s. Not only does my son learn but I learn too. I notice that it’s easier for my son to express himself. Its easier for the both of us. I just leave the cd on and go through it with him. He loves it, I love it, and he’s excited that he is doing something with me. I would definitely recommend this to anyone who wants to start communicating with there LO early. I started this with him when he was 6 months. It works well and he even started to say the words as he did the sign languages. As a mother of a non verbal child with Down Syndrome, this kit has been very helpful! My son loves the flashcards and I loved the dictionary! 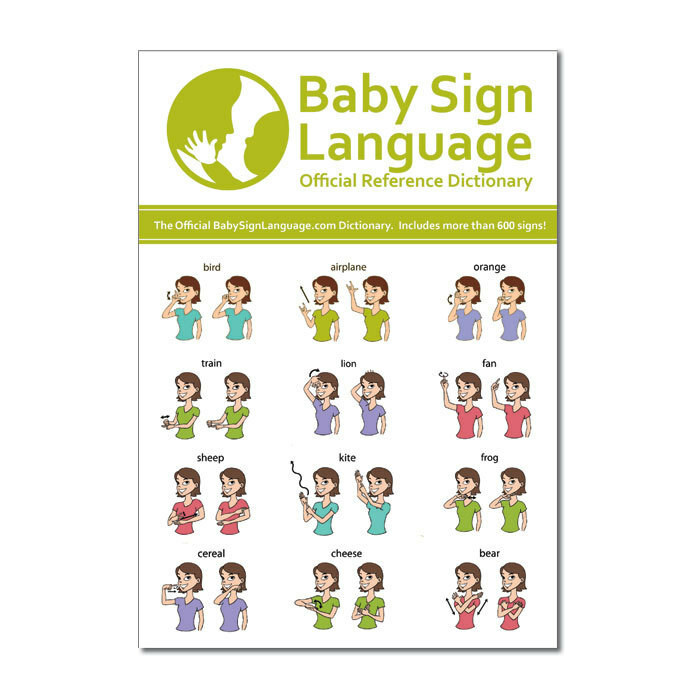 As an educator for the city in which I work I have the opportunity to teach baby sign and I utilize the poster and the website frequently. The babies love the flashcards, the only thing I wish is that they were plastic because they like to chew them. I would highly recommend this product, great quality for the price as well! My daughter will be two in October and started watching these videos when she was about four months. It’s so amazing to me how fast she picked up signing. I’ve been learning along with her which has made it fun for both of us. She signed her first sign at 6 months and we were so excited. These videos have become a part of our daily routine. She looks forward to watching them everyday. One of the things I love the most is if she’s trying to tell us something but we can’t understand she can sign it too is!! Not only have these videos given us a learning experience we can enjoy together but it has also help cut down on fits and tantrums do to us not understanding her words as well. Now she speaks and signs simultaneously. I purchased baby signing time for a couple of friends too I loved it so much! I would recommend this to every parent. Such an amazing product! I bought these as gifts for the elders of 2 babes caught up in the overwelming American medical sales system ($3000 hearing aids…). Though I don’t expect me to make much use of it, it is pleasing to know about and share your good work. How bout a mobile app that doesn’t need online connectivity? Thanks for your suggestion. We have been doing some work toward finding a mobile solution that does not require connectivity. We love the baby sign language kit that we purchased. We got it when our son was just a few months old. He is now almost 2 and his communication skills are outstanding. He still watches and practices his signs. Thanks to this program, he was able to communicate very early on and that cut down on his frustration from us not being able to understand what he was asking for. Thank you from the bottom of our hearts!! I started teaching my daughter about 16-18 months. She is two now and tell me when she is hungry, done, wants more, milk and a few more. She can communicate so well. If you are thinking of doing this dont put it off. Children learn so much and they will pick it up quickly.If i had known about this with my oldest daughter i would had used it also. My daughter loved signing. I started signing with her from birth and she signed her first word “milk” at 8 months old. By the time she was 12 months old she could sign 20 words. Because of Baby Signing Time, she learned to speak (and sign the words) at an early age of 15 months speaking 3-word sentences. She loved going through the flash cards and she even asked to watch the DVDs by signing “baby” “signing” “time.” I am so glad I taught her sign language and will definitely be teaching my second baby how to sign. 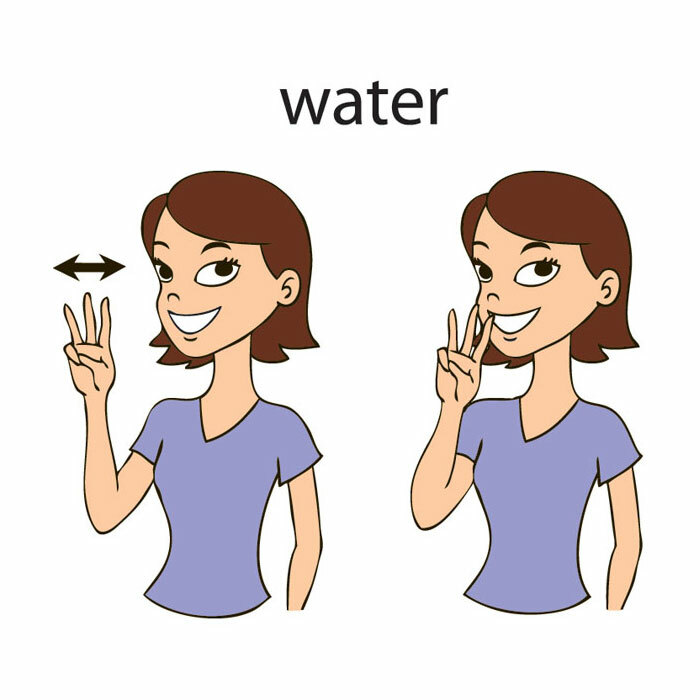 My daughter and I love the baby sign language flash cards. She learned all of them by 18 months old and was proud to be able to communicate with me. I liked the real life images instead of cartoon caricatures. I felt like my daughter had less tantrums and frustrations because she could communicate basic needs and draw my attention to items she found interesting. For instance, she would sign “airplane” when she heard or saw one going overhead and we could share that moment together. My daughter enjoyed getting out the flash cards and felt a sense of accomplishment identifying each one. I plan on using them again with my 3 month old son. I would highly recommend baby sign language. My son loves baby signing time. I’m going to buy him the treeschoolers set soon his favorite clip is photosynthesis. I enjoy it as well it is rewarding knowing your learning a new language with your child. My mom got me the kit before my baby was born. I found the intro book was very informational and encouraging. I started using milk really early and by 5 months he understood that sign. At 15 months, he now uses about 10 signs regularly and seems to pick up new ones quickly when we remember to look them up. His favourite signs are ‘cracker’ and ‘more’. 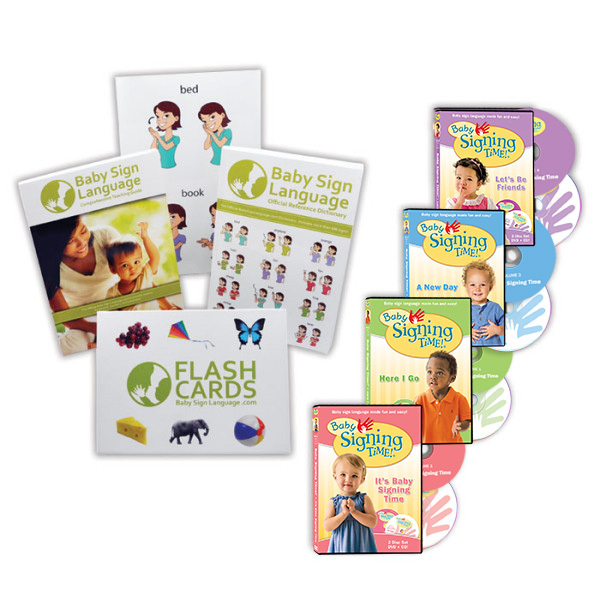 We love baby sign language because he doesn’t speak much yet and is learning both French and English, so sign language gives us an easy way to communicate. I also really appreciate the online videos because sometimes it’s hard to tell what the picture in the dictionary is trying to tell you to do. Overall a great product! My baby has 8 months today. She signs ‘milk’ only. But we are Learning other words. We use many signs as we can in daily activities. Very high quality product, great not only for sign language but also for language generally or classification learning (food, animals, outside things etc). Great in conjunction with the website for when you can’t quite figure out the sign from the picture (the illustrations are great but it’s a tricky thing to communicate). 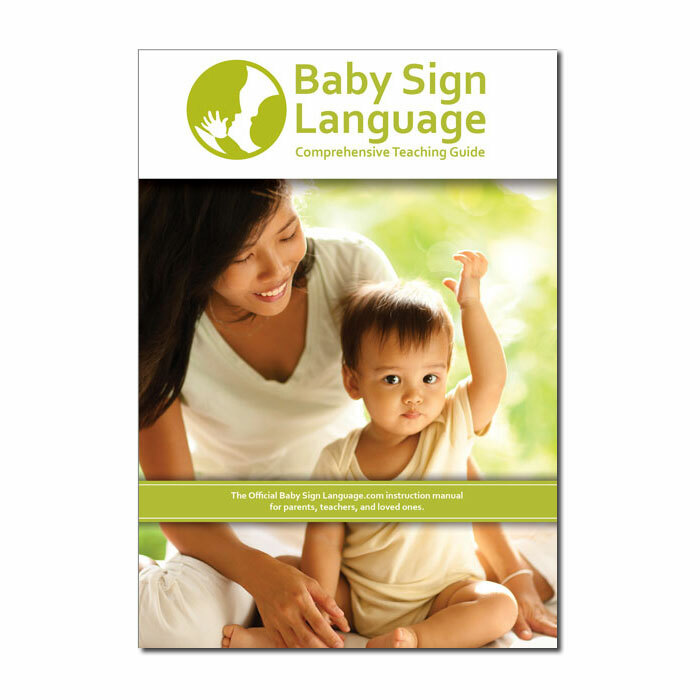 Definitely recommend – I have no doubt that using baby sign language reduced tantrums significantly! I believe that Baby Sign Language really removes a child’s frustration yearning to communicate. She could not say milk, eat, Mommy, or Daddy but she sure did pick up the signs. For a grandpa, my granddaughter and I would sit and watch the DVD endlessly and learn the signs together. Priceless memories. Now she can talk a bit. But, we still communicate through the signs. This product allows for communication and reinforces the importance of a willingness to learn. My daughter is able to communicate with sign language in combination with her starting to talk and I can understand what she needs and she can also tell others who know the signs what she needs. It is incredible to watch her catch on. It is an amazing learning tool and I Highly recommend it. It was a good quality product – and still is. It has survived one child at this point and is taking on a second as I write this. 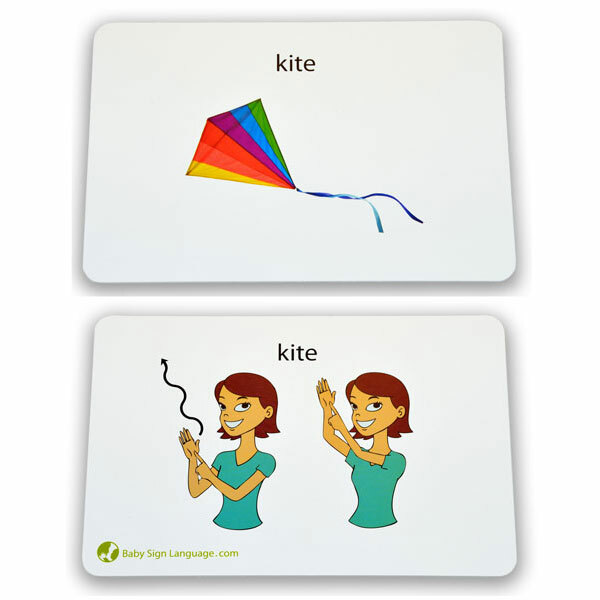 The images are very clear and the flash cards really cover a lot of the words that children first learn. It was a very well conceived product. My eldest (almost 3) caught on to verbal language very early and I believe the sign language helped her do so. Also, I’m not sure if this is more a reflection of her temperament or what, but she didn’t really tantrum much at all. I believe that knowing how to communicate with us before she could talk was instrumental in alleviating a lot of frustration on her part, thus mitigating many a tantrum. *My second child is still very young so I can’t speak to what his experience will be. My child was advanced from birth, and I was always looking for ways to stimulate her desire to learn and grow. This kit was indispensable for years. She LOVED it and I learned another language. 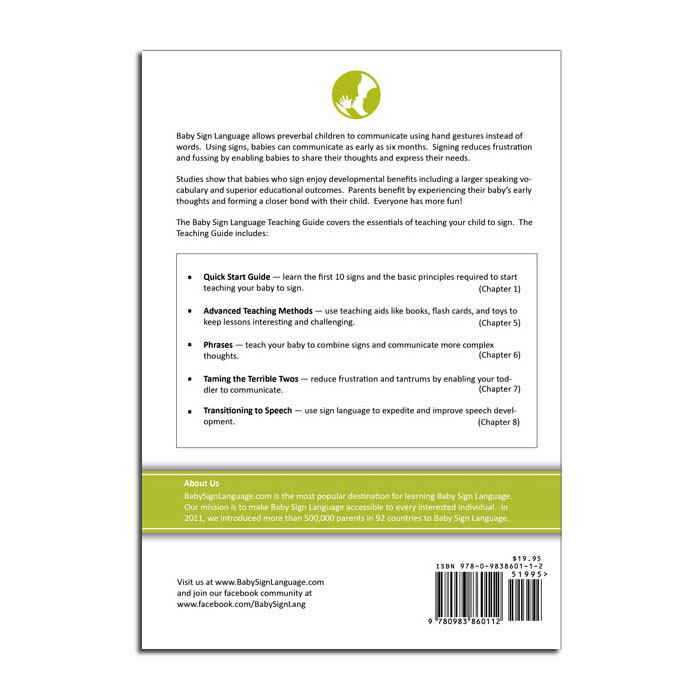 I had been intimidated at the thought of learning signs enough to teach her and this kit beyond all others stands out because it really breaks it down into a manageable even enjoyable activity. I have recommended this kit to every new mom I know who aspires to be active involved and relish every moment of motherhood.